The idea of treating patients using remote video applications may seem like something out of the Space Age. Turns out, it is. NASA began using telehealth related technologies in the 1960s to monitor and manage the health of astronauts. Since then, the technology that makes it possible to provide remote care has advanced in quality and become much more economically feasible. Today, it is quite possible for many types of providers to deliver care via video. There are a number of research studies and polls that prove telemedicine’s popularity and effectiveness. 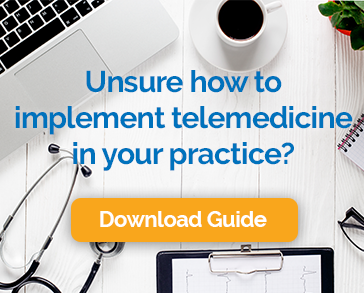 We’ve pulled together a few telemedicine facts that may surprise you. Several studies have revealed that healthcare organizations and independent providers have a strong interest in providing telemedicine services. In fact, about 90% already offer, or are planning to offer telemedicine services. Only 13% report that telemedicine is not a priority. Remote visits are popular with providers because they can increase practice revenue, introduce more flexibility, and meet growing patient demand. This year, approximately 350,000 patients will use telemedicine services. This is expected to reach 7 million by the end of next year. A study by West Monroe Partners found that of those who have experienced real-time communication with a mobile app, 80% prefer this method to a traditional in-office encounter. Research by Deloitte shows that millennials are about 20% more likely to use telemedicine than seniors. This means that providers looking to future-proof their practice should think carefully about the role of telehealth. For patients, it offers convenience, cost savings, and an effective way to manage both acute and chronic conditions. Both insurance companies and state governments recognize the value of telemedicine, not just for individual patients, but for the healthcare system as a whole. That’s why 31 states have passed bills that require insurance companies to cover telemedicine to one degree or another. Many require provider reimbursement for video visits that is on par with in-office services. In addition, insurers see telehealth as a way to increase efficiency and drive down costs. That’s why many now cover remote visits even in states that don’t require it. For example, United Healthcare pays claims for telemedicine services for more than 21 million members on individual, employer, and Medicare Advantage plans. United sees telemedicine as a way to mitigate what is, according to the American Association of Medical Colleges, a shortage of 45,000 primary care physicians in the US. According to the Mercer National Survey of Employer-Sponsored Health Plans, almost 60% of America’s large employers currently provide medical coverage for telemedicine, giving workers the option to conduct video consultations with providers using a smartphone, tablet or desktop computer. This is a sharp increase of almost 30% over last year. The survey included more than 2,500 companies with at least 10 employees each. Another report from the National Business Group on Health found that in states where it is legal, nine in 10 large employers will make telehealth services available to their employees by the end of this year. Chronic conditions like diabetes, irritable bowel disease, multiple sclerosis, and others affect about 133 million people in the US, according to the National Health Council. That’s more than 40% of the total population. Managing a chronic condition can be a burden on patients who are already dealing with the illness itself. Video visits reduce the amount of effort and time that patients must devote to their own care. This makes it easier for them to comply with treatment plans, improving their health as a result. In one study, the Veteran’s Administration was able to reduce the number of bed days of care by 25% and the number of in-hospital admissions by 19% using home-based video visits. Health information technology (Health IT) is a broad field that covers digital medical records, electronic prescription services, online appointment scheduling, remote patient monitoring, and more. The Health IT market is enormous, and telemedicine represents about one-quarter of it, putting its value at somewhere near 15 billion dollars. Estimates are that the number could reach $20 billion by 2019. The data is clear, telemedicine is an increasingly important channel for healthcare delivery in the United States. Patients and providers alike are increasingly benefiting from the approach. It increases the efficiency of the entire healthcare system and provides quality health outcomes. There is strong momentum and we expect even more eyebrow-raising statistics from future research.